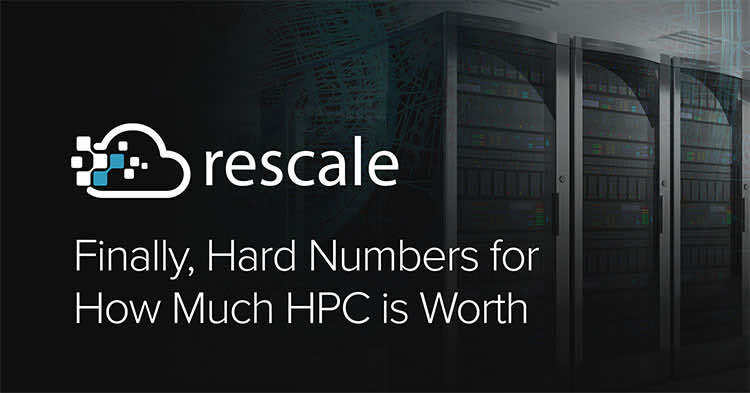 Here at Rescale, we care very much about the cost and value of HPC. It was a major topic in our previous blog post “Addressing the Cloud Cynic.” So, we thought we’d back up some of our claims with the cliff notes from a key analyst’s study. In June 2018, Hyperion Research updated their global HPC study that used close to 700 different case studies over a 3 year period to help calculate the impact of HPC on enterprises. It breaks down the return on research and returns on investment associated with capital expenditures on HPC. The following information is focused on data extrapolated from the key industries that Rescale focuses on: Academic, Defense, Government, Life Sciences, Manufacturing, Oil and Gas, Telecomm, and Transportation. The average revenue earned per dollar spent on HPC is $332.80. The 3 highest are Transportation, Government, and Oil and Gas at $1804.00, $1205.00, and $416.00, respectively. The 3 lowest are Academic, Defense, and Manufacturing at $9.20, $75.00, and $83.00, respectively. The average profit earned per dollar spent on HPC is $40.60. The 3 highest are Government, Oil, and Gas, and Academics at $112.00, $53.00, and $44.00, respectively. The 3 lowest are Defense, Transportation, and Manufacturing at $5.30, $15.60, and $20.20, respectively. The average cost of innovation required $11M in HPC usage. The key drivers of HPC use are scientific breakthroughs and support research programs at $76M and $27M, respectively. Those two types of innovation create a strong HPC market in Companies and Academics, not Government sectors. The data is heavily influenced by the outliers. 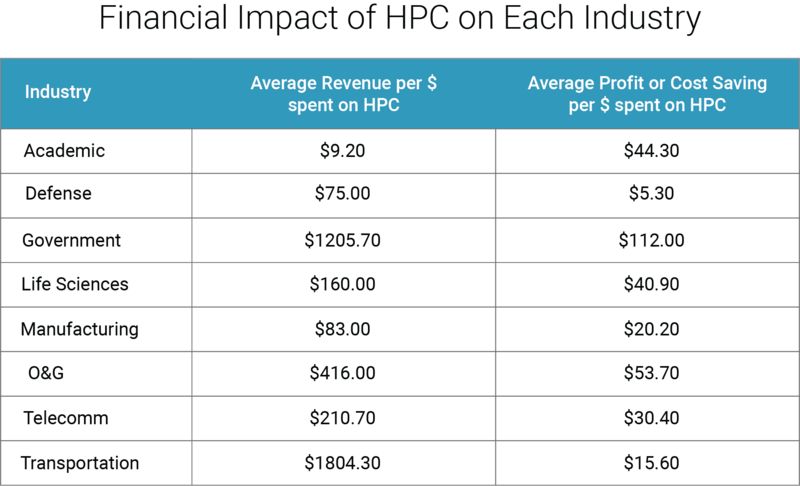 Average profit generated, excluding the top and bottom outliers (Government and Defense), is equal to $34/ dollar spent on HPC. Interestingly, Transportation companies that utilized HPC were the largest revenue earners, but the second smallest profit earners. Companies engaged in innovations in scientific breakthrough and support research programs are strong drivers of HPC usage. Understanding the impact and value of HPC on your organization is not as easy as applying industry metrics to your company. The true cost of ownership and practical application for HPC requires a deep dive into organizational needs and inefficiencies; however, these market statistics prove that HPC has had a positive impact on all organization and should be considered for every organization. *The statistics provided were calculated from a subgroup of the overall data that represents Rescales’ target markets. The full study can be viewed in the link provided.